Day 2 of the Game Developers Conference was dominated by a huge announcement from Google. Day 2 at the Game Developers Conference (GDC) 2019 was without a doubt dominated by the announcement of Google Stadia, a cloud-based game streaming platform. This service—scheduled for release in 2019—is set to change the landscape of gaming for many years, but it does have some serious unanswered questions and could be less than a dominant force in the gaming market. Not to be lost in the shadows, Tuesday also saw the partnership between Unity and Tencent, bringing the capability of the cloud to the rugged game development engine. Google announced its new cloud-based streaming service, Stadia, during its 1:00 pm ET keynote; although some details are lacking, the technology looks promising. Stadia is a game streaming service built on top of the Google Data Center network, which includes over 7,500 edge nodes and is connected by high-speed fiber-optic links around the globe. While game streaming services have been lackluster in the past, Google appears to have the technology and network backbone to support its attempt at this type of service. [Stadia is] focused on gamers, inspired by developers, and amplified by YouTube creators. The combination of computing power and ubiquity of devices practically removes any technical limitations for game developers. Google espoused this concept throughout the presentation: unleash the full potential of developers to create games without having to scale down their imagination due to hardware and visual limitations. While these appear to be lofty goals, Google has put its full weight behind Stadia and seems intent on driving Stadia to its full potential. During October of last year, Google beta-tested its Stadia service through Project Stream, which allowed users to play Assassin's Creed: Odyssey through Google Chrome, all without downloading any additional software. The results were surprisingly good, as most expected a game streamed through a browser to be of poor quality and have high latency. Instead, Odyssey streamed in an impressive 1080p resolution at 60 frames per second (fps). 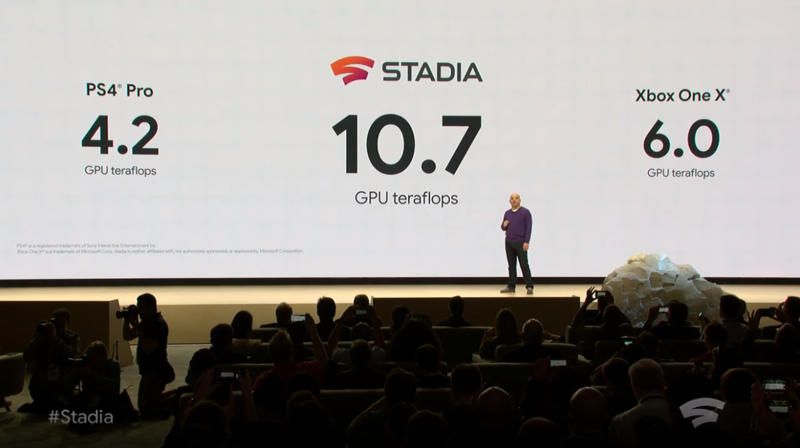 To facilitate game streaming on such a wide variety of devices, Google also announced the launch on the Stadia Controller. This controller has the standard buttons expected for a game controller, but also includes two additions: (1) a Google Assistant button and (2) a capture and share button. The Google Assistant button allows a user to ask a question through the microphone included in the controller. This functionality makes the task of finding help in a game seamless: Instead of opening a separate device and searching for help, Google Assistant will attempt to find the help you need and immediately display it on the same machine as the streamed game. These benefits combine to give a smooth multiplayer experience, but there is still one problem: The internet connection between the player and the Google Data Centers. If this connection is slow or disconnects completely, the streaming service becomes completely unavailable (i.e., no offline play). Google announced that is has been working with id Software and Doom: Eternal will be a launch-day release for Stadia. In addition to this launch title, it has already shipped out over 100 development kits, and over 1,000 developers and creators are currently working with Stadia. Moreover, it has partnered with both Unity and Unreal to ensure that the two most popular game engines work with Stadia out of the box. Stadia's utilization of the Vulcan open-source Application Programming Interface (API) also significantly reduces the hurdle from development to deployment in this cloud architecture. For more information on the development support for Stadia, see the Stadia developer website at stadia.dev. How much does the service cost, if anything? What are the launch games besides Doom: Eternal? How much data will the streaming service use each hour? Will this service be cross-platform with other gaming systems, such as PS4, Xbox One, and Nintendo Switch? Stadia does have a lot of promise, but at the moment, it is difficult to tell how successful it will be in the long run. It is too soon to know how this service will ring with gamers and if the gaming community will latch onto Stadia. More details presented before making a definitive determination can on the viability of such an ambitious project. With the largest gaming community base, it is no secret that Tencent is an expert in powering the best and the brightest and the most successful in China. Unity also announced that this Tencent Cloud gaming service would be available in 2019. 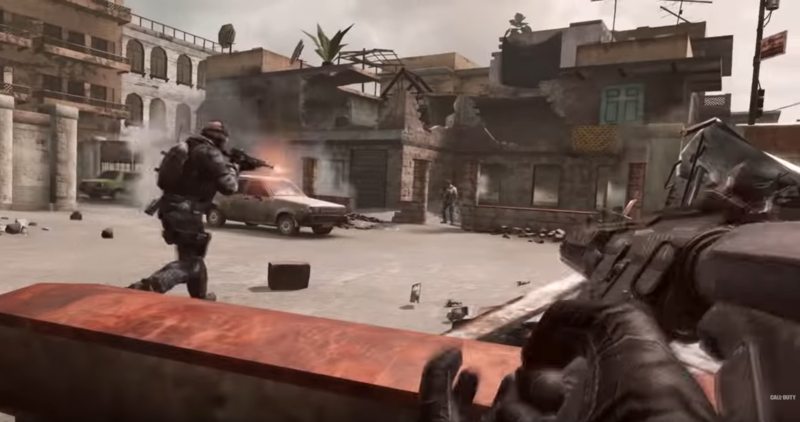 Additionally, Unity has partnered with Tencent to bring Call of Duty to mobile devices—aptly named Call of Duty: Mobile (image from Call of Duty: Mobile trailer).